LIVE (Locals Into Victoria’s Environment) is a non-profit, community organisation based in the City Port Phillip, a suburb of Melbourne, Australia. Our goal is to reduce the human contribution to, and the impact of, climate change on our planet. We do this by creating and delivering information, facilitating actions, involvement in campaigns and influencing decision makers. Deborah Hart, founder of LIVE and convenor of ClimActs (Acting for Climate Justice), wrote this submission to the Australian Competition and Consumer Commission’s (ACCC) inquiry into digital platforms. The submission has been published, with her permission, on Croakey.org here https://croakey.org/trolls-taxes-trust-a-call-for-action-on-digital-platforms/ As there is little time to make your own submission (the deadline is 15 February) why not simply send an email endorsing what Deb has written. Ian Plimer‘s latest attempt in the pages of Murdoch-owned The Australian newspaper to shoot down climate science had so many clear errors it should embarrass the editor who printed it. The climate disaster future has arrived while those in power laugh at us. Whether marching in the street or raising hundreds of thousands of dollars for legal fees, Melburnians are joining action groups in droves. And again, perhaps curiously, we turn to Domain for some politics, this time at a local level. More and more, people are realising their agency in decision-making and not leaving it to the ‘powers that be’. When it comes to power, it’s in our hands – so be prepared to use it. In case you haven’t heard, a climate disaster is looming. The effects of climate change—like rising seas and intensifying weather patterns—are already here. Fears rise for homeless and vulnerable people as communities brace for another week of relentless hot weather. Credlin has put short term political interests, and the interests of the coal industry, before the future of our country. Oliver Yates, ex CEO of the Clean Energy Finance Corporation, is an active member of the Liberal Party. He has been scathing of LNP policy regarding climate change. In this article he again flays them and particularly the Queen of the Dark Arts, Peta Credlin, for standing in the way on progress. He is genuinely liberal and he can turn a phrase – have a look. When President Trump announced his plans to withdraw America from the landmark Paris agreement he was faced with condemnation from not only the public but many leading corporate figures such as Elon Musk (founder of Paypal, Tesla and Space X) and Tim Cook (CEO of Apple). This however did not deter him from pulling out. Portland generates electricity from turbines in water pipes. Portland has replaced a section of its existing water supply network with Lucid Energy pipes containing four forty-two inch turbines. To save one of the rarest butterflies in the world, we also need to save an unnamed ant species, an endangered woodland and a parasitic plant. 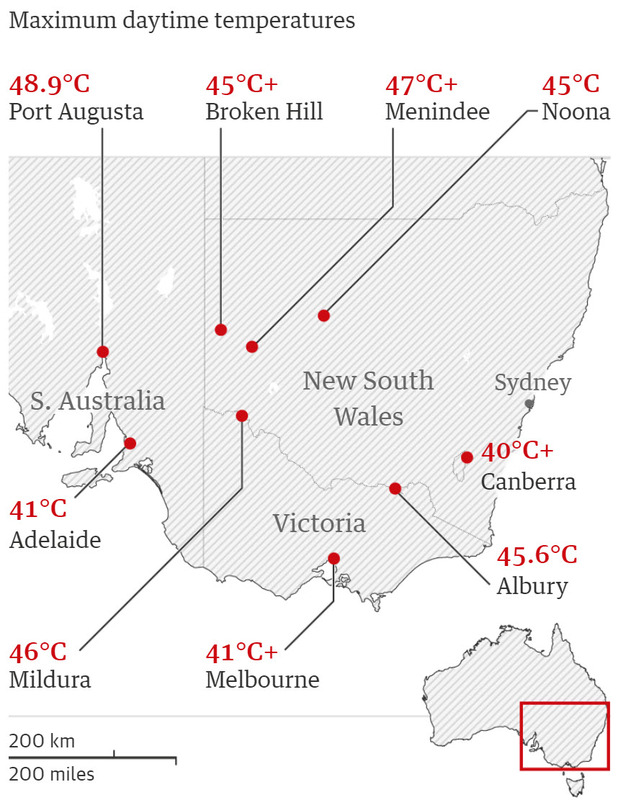 With heatwaves like this, what sort of future do we have in store? I don’t really want to spoil your New Year with this article, but the changing of the year is a time to make plans for the year to come. Are we at the tipping point for climate action? In 2016, when we started our campaign calling on the Australian parliament to declare a climate emergency, we had no idea how far and how fast the idea would spread. Within a year we had the support of 20,000 individuals and 55 groups. Scientists, journalists and politicians from across the political spectrum had spoken out. TED TRAINER. The case for De-growth — will continue to be ignored. A De-Growth movement has emerged, mainly in Europe, in response to the fact that global levels of production and consumption are now grossly unsustainable. A vast literature documenting this has accumulated over almost fifty years. But the official world of politicians, governments, economists and media completely ignore it and devote themselves to growing the economy … that is, to accelerating us to our doom. Let’s be honest – environment news isn’t always the jolliest, and 2018 was no exception. From climate change, to recycling, to energy policy, at times it has felt like we’ve been lurching from one crisis to the next. So here are ten upbeat environmental stories from this year that prove it’s not all doom and gloom. The Bureau of Meteorology and CSIRO play an important role in monitoring, archiving, analysing, interpreting and communicating Australia’s observed and future weather and climate. This week there are talks in Poland to work out how to implement the Paris climate agreement, as the world’s most respected scientific bodies continue to issue ever-more urgent warnings about how humans are changing the climate. Almost one in three households report having problems with their solar panels but experiences are improving and more than half are considering if they can use batteries to get off the grid, a survey by Choice has found. Over 300 species of vertebrates in Australia depend on hollows in large old trees. Let’s face it: 2018 sucked. But before we pop our champagne and wish for a year of fewer environmental failures and heartbreaking studies, hold onto the strides we made this year. Comment by Liberal Senator James McGrath. Rioting is not one of the three ‘R’s, but being responsible and taking part in real learning is what education is all about. These kids are learning about the democratic process through participation – and all power to them. On so many counts, the possibility of Adani going ahead is disgraceful. Matt Canavan’s little Aussie battler, Indian billionaire Gautam Adani, is now saying he’ll self-fund a much-reduced mine. Threats to water availability and quality, to the reef, to tourism jobs, to Galilee Basin biodiversity are all scary. Then there’s the emissions when the coal is burnt. Thank you for the leadership school students are showing, with commitment, with intelligence and with humour. Researchers forecast more disease and disaster as the planet warms. Trump dismisses the the findings of a 1600-page report into climate change. The ‘leader of the free world’ talks about the US Administration’s climate change report “… a lot of people like myself, we have very high levels of intelligence but we’re not necessarily such believers … the air is incredibly dirty, and when you’re talking about an atmosphere, oceans are very small.” This guy is a blithering idiot but on this, as in so many things, his stupidity is dangerous. A 15-year-old Swedish girl started a global movement. Here’s why I’m joining it along with thousands of other students who care about the planet’s future. LIVE wholeheartedly congratulates Daniel Andrews and his Team for their win in the Victorian Election. Their determined progressive policies to transition our economy away from dirty and wasteful energy systems to clean and renewable power, and investment in long neglected public infrastructure and services to address deep societal inequities and injustice have proven enormously popular. A grim U.S. government assessment of global warming’s economic impact gives a whole new meaning to Black Friday. And, exactly one year ago, they were warned. A new party set up by frustrated taxi drivers appears likely to win two seats in the next Legislative Council, despite winning only a tiny percentage of votes. 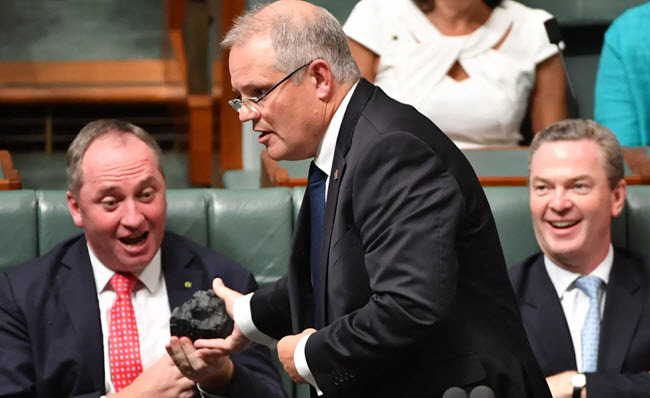 Two public-spirited citizens have come up with a plan for a $50 per tonne carbon tax which would take from the rich and give to the poor. Labor announced its energy plan on Thursday, with climate change action as a central component. But does it stack up? Imagine not believing in climate change, the immense relief for it to all be a hoax or for the scientists to all be wrong. I received this email a few minutes ago. You might be interested. There is a very short window of time to get out of pure-play oil and gas company investments without substantial losses. It is imperative to sell them now. 3. public interest as their motivation. With Turnbull knowing that too many in the LNP believe that climate change is a fraud, the first doesn’t apply, therefore the second can’t be considered and the public interest doesn’t even enter into it. Greg Hunt. The most common recycling mistake made by Australians is to throw soft plastics, such as bread bags, into the kerbside recycling bin. By downplaying our environmental crisis, the presenter’s BBC films have generated complacency, confusion and ignorance. The Victorian Liberal Party has been accused of ignoring climate change and is facing calls to address the issue ahead of the state election. The Victorian Greens would push for a 17-kilometre bike lane from Brighton Road in Elsternwick to Bell Street in Coburg, if the party helps form government. Direct action and civil disobedience are now needed to force governments to see that our survival as a species is at risk. The country’s new president, Jair Bolsonaro, wants to increase development in the Amazon rainforest, which absorbs a massive amount of carbon emissions. The technique has been used to help people fall asleep in the most uncomfortable circumstances. It’s said to work for 96% of the people who tried it for six weeks. Labor has been urged to abandon its plan to subsidise rooftop solar installation for 650,000 Victorian homes. If the world’s population keeps growing, and the poor world’s living standards keep catching up with the rich world’s, how on earth will the environment cope? Here are six steps that could be taken straight away by a new Labor government to address the challenge of climate change, without legislation. An Anglican priest teaching climate change is often asked about the difference between science and faith. As Clean Up Australia has grown over three decades, so has our awareness that reducing rubbish is as important as cleaning it up. Tim’s “My Efficient Electric Home” facebook group has over 4,500 followers and is increasing at 100+ per week. It contains a wealth of information from local enthusiasts on becoming “all-electric”. The IPA is usually described as a “radical libertarian think tank” but it’s not libertarian, since its freedoms for the few spell oppression for the many. It’s also not-thoughtful and so not-public it’s almost clandestine. Why it’s important to transition to an all-electric home? What are the key steps to take? This speech was delivered by Tim Forcey at the launch of the CERES Eco-house on 9 October 2018. Tim has 35 years of industrial experience (electricity, oil and gas, petrochemicals) with focus on energy production, transmission and consumption. All of my friends are becoming grandparents. I am thinking about the world that our grandchildren will inherit. What will it take on climate change? Hurricanes, algae blooms, rising seas and melting ice. How much more before climate denial fades away? A new U.N. report should sound alarms that climate change is far closer than most people realize. It probably won’t. The easy way to cut emissions – closing coal power stations – is exhausted. Now the public has to be convinced to make sacrifices. 1.5C has become the new “safe” upper-limit for global warming – but whatever happened to the two-degree target? With the escalating cost of natural disasters, insurance companies have a greater incentive to use their leverage to enforce not just better building codes but also to improve climate change regulations. 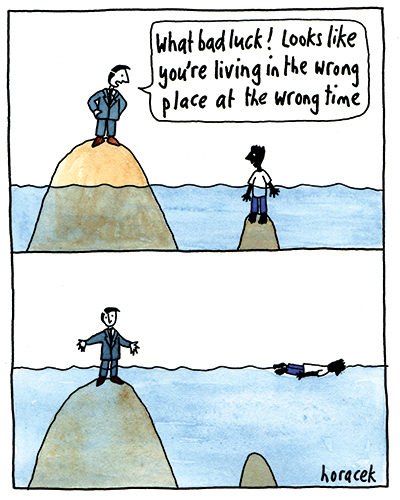 Judy Horacek is a cartoonist who publishes a newsletter on the first day of the month. September 2018’s newsletter was on Coal, Energy, Reefs. October 2018’s was on Denial and Extinctions. How can we keep microfibers out of food, water and air? Microfiber pollution is a growing problem around the world, with miniature contaminants shed by synthetic textiles being found in our food, our water and the air we breathe. What’s a concerned citizen to do? Three human rights activists, two corruption fighters, a farmer and an agricultural scientist are the 2018 winners of the Right Livelihood Award. They are tirelessly fighting the world over to make it a better place. The Andrews Government announces significant rebates on Solar Panels and Solar Hot Water systems. Rebates are available for systems installed from 19 August 2018. This is very good news, but it relies on the Andrews Government being re-elected. The daily post of environmental articles has been published every day since 2011. You can spend your whole day reading articles of climate change gloom and doom. So I am not going to publish it here anymore. Even I only read a couple of them. For those that don’t see it this way you can still read it on Greg Hunt’s Blog. One article per day will still be published here. To read these single articles scroll upwards.